FingerTec’s partner in Pakistan, Applewood has successfully installed FingerTec card access control and time attendance system for the Shifa International Hospital. Shifa International Hospital, Islamabad is one of most renowned health care center in Pakistan. It started its operations on 26 June 1993, but the construction began earlier once they acquired the 11 acres of land in 1987. Today the hospital is still expanding by constructing new blocks to add to the existing block A and Block-B. With the concern of security in mind, they have opted to install FingerTec Kadex and i-Kadex along with access control for securing the state-of-the-art blood bank and different types of laboratories within the hospital. This is for the prevention of any unauthorized personnel accessing the laboratories and tainting and samples in the lab. Due to the nature of the place, the installations had to be done at odd hours of the day because all the labs are located very close to the ICU & CCU. This step was taken to minimize the noise and disturbance toward the patients. The hospitals were cooperative enough to let us work late at night to complete the installations of the FingerTec terminals. Now, the staff and personnel of the hospital can be more at ease and focus on their primary duties while FingerTec keeps their labs and blood banks secure. 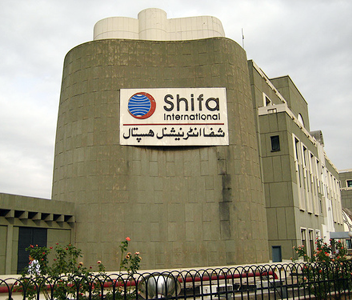 The Shifa International Hospital in Pakistan. Any comments or feedbacks please email to editorial@fingertec.com. Copyright © 2013 FingerTec Worldwide Sdn. Bhd. All rights reserved.